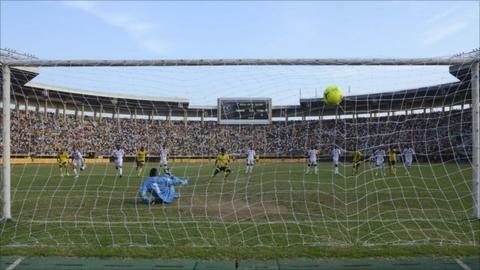 Namboole Stadium in Uganda has been closed to allow repairs to be made ahead of the 2013 Africa Cup of Nations qualifier against Zambia on 13 October. The decision follows a complaint by Zambia's Football Association (Fufa) to the Confederation of African Football over a week ago about the playing field, which it claimed was not ready to host a high-profile match. Zambia's two-man advance team visited Uganda and took pictures of the pitch, dressing rooms and toilets. And in a letter to Caf, Zambia General Secretary George Kasengele requested urgent intervention into the matter, calling for Fufa to consider improving the playing area and dressing rooms so that they meet internationally accepted standards. Fufa chief executive officer Edgar Watson has confirmed that reparation work will be carried out. "We want to have a good game without any complaints," the former Uganda Cranes skipper told BBC Sport. Namboole Stadium chairman Dan Tamwesigire revealed that all events in the stadium have suspended in order to carry out the improvements. He told BBC Sport: "Yes, our partners Fufa asked us to make certain repairs ahead of the game and we have started doing so." The Cranes, who are coached by Scotsman Bobby Williamson, started training last week with a majority of local-based players training, while residential training starts on 30 September. They are 1-0 down to Zambia from the first leg of the final-round qualifier - a Christopher Katongo goal giving the African champions a slender advantage. Uganda have not qualified for the Africa Cup of Nations since 1978.